BULLETIN: UPDATED WITH INFORMATION FROM THE CFTC AT 7:03 P.M. EDT (U.S.A.) Perry and Rachelle Griggs are on the lam after running a Ponzi scheme while Perry Griggs was a federal prisoner in Nevada, the FBI said. The alleged commodities scheme consumed about $3 million and was targeted principally at inmates and family members of inmates, the FBI said. Separately, the CFTC said Perry Griggs ran a previous Ponzi scheme that resulted in convictions for wire fraud and money-laundering, a restitution order for more than $3 million and a 96-month prison sentence. Perry Griggs began serving the sentence in 2003, but hatched the new scheme while incarcerated. Yet-another scheme grew out of the scheme Perry Griggs hatched from prison, according to the CFTC. If the allegations are true, it means that Perry Griggs has been at the center of at least three fraud schemes since 2003, and launched two of them while in federal custody. The scheme for which Perry Griggs began serving time in 2003 involved coffee futures, the CFTC said. Even as he was serving time, Perry Griggs executed trades for the new scheme from prison by using the Internet and a telephone, according to court filings. Perry Griggs and his wife lost investors’ money in the new scheme and made Ponzi-style payments to cover up the fraud, while also stealing about $1 million to pay “for personal expenses, including luxury car leases, renting a home in Hawaii, purchasing jewelry and chartering a private jet,” the CFTC said. The couple went missing from a halfway house after Perry Griggs’ release from prison. Perry Griggs was on parole for the earlier Ponzi scheme when he fled while the second scheme was unraveling, the CFTC said. Perry Griggs was housed “with a large number of inmates from Hawaii,” the FBI said. He was released from prison in late 2008, and went missing with his wife from Las Vegas in January 2010. Indictments against the husband and wife were returned by a federal grand jury in Hawaii yesterday. PERRY JAY GRIGGS is 49 years old, 5â€™10â€ tall, 180 pounds, with grey hair and blue eyes. He is known to have expensive tastes in sports cars, high-end clothing, cigars, and golf, the FBI said. RACHELLE LOUISE GRIGGS, also known as RACHELLE RUTLEDGE, is 42 years old, 5â€™4â€ tall, 150 pounds with blonde hair and green eyes. Anyone recognizing PERRY and RACHELLE GRIGGS or having information as to their current location is asked to call the Honolulu FBI at 808-566-4300. Perry Griggs also spent time in federal prisons in California and Texas. 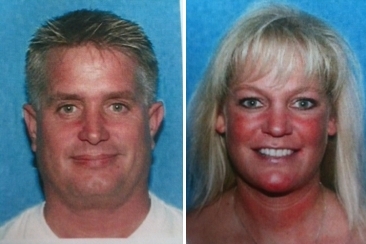 The Ponzi that put the couple on the lam operated through a scam company known as Aloha Trading Co., which purported to be in the business of trading commodities, the FBI said. Meanwhile, the CFTC said investors in the second scheme were lured by the promise of high returns. Some investors refinanced their homes and liquidated retirement accounts to invest with Perry and Rachelle Griggs. A third scheme grew from the second scheme and involved a company known as Paradise Trading LLC, the CFTC said.